I just returned from Australia, where I shared foldforming and keum-boo lessons at a few schools. While I was in the country, I visited several jeweler’s workshops in Brisbane, Sydney, and the Gold Coast, where I picked up a number of ideas and tricks I felt were clever and worth sharing. Many things are more expensive in Australia than they are in North America, including basic tools and books. Therefore, jewelers make or adapt tools for their workshops. One example is Wendy Hearn of Sydney who mixes Mod-Podge (an all-in-one glue, sealer, and finish used by artists and scrapbookers) with graphite powder to produce conductive paint that she can use for electroforming. This is much cheaper than buying the commercial versions of this conductive paint, and it can be used to coat non-conductive materials such as wax or plastic or sealed baby boots so that you can grow metal on their surfaces. Sel and Lorraine Pilgrim have a shop in Surfer’s Paradise on the Gold Coast that is full of similar innovation. 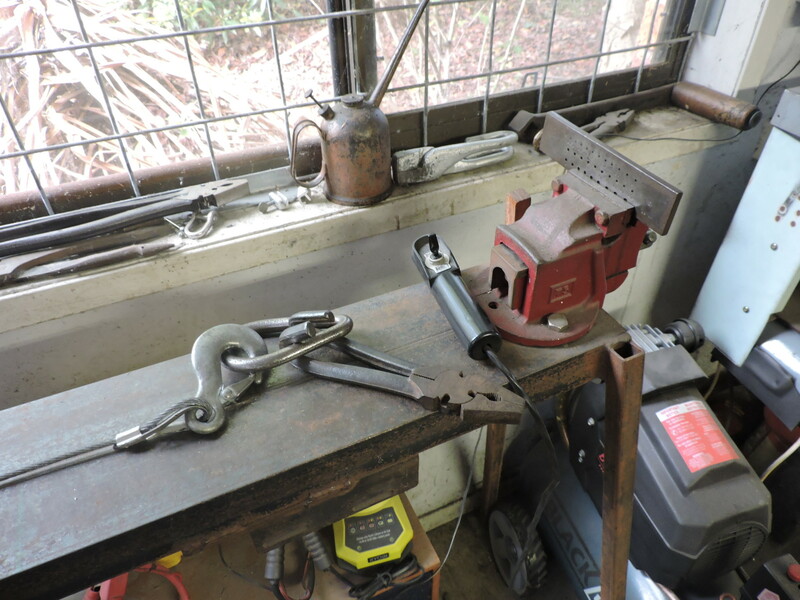 The drawbench for making wire and tube is homemade, with a vise to hold the draw plates and an altered pair of pliers that grip the wire end better than standard draw tongs. Some of the alterations they made to the pliers include smoothing off the teeth in the jaws so they grip better and do not damage the wire point to be drawn. The handles of the pliers have also been heated and bent back so that they can hook into a large steel ring that is attached to the 3/8-inch steel drawing cable. The bent handles automatically tighten the plier jaws onto the wire when using the drawbench. 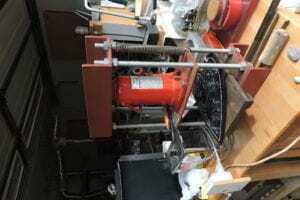 An electric boat winch powers the drawbench. To operate it, a wire is placed in the drawplate, the pliers clamped onto the protruding wire tip, and the switch for the boat winch is used to start drawing. The cable winds up into the housing of the boat winch. 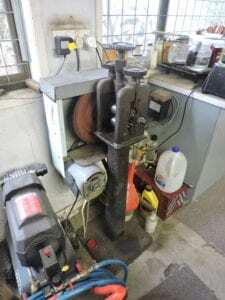 Sel has converted a hand rolling mill into a powered version using automobile transmission gears and a belt and pulley system in order not to have trouble with the gears under strain. This saved him a lot of money, as a powered mill in Australia would have been 10 times more expensive than his converted hand operated mill. His powered mill saves his shop much in time and labor costs. 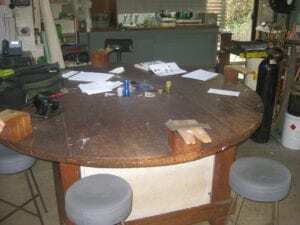 They also have a round worktable at the shop that allows different tasks to be done at each of the table’s four bench pin stations. 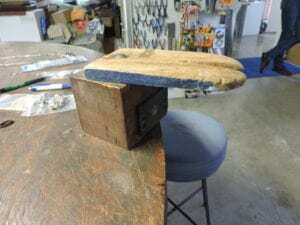 The bench pins are raised to the correct working height. When not in use for making jewelry, this table also permits the teaching that Sel has done once a week for years. 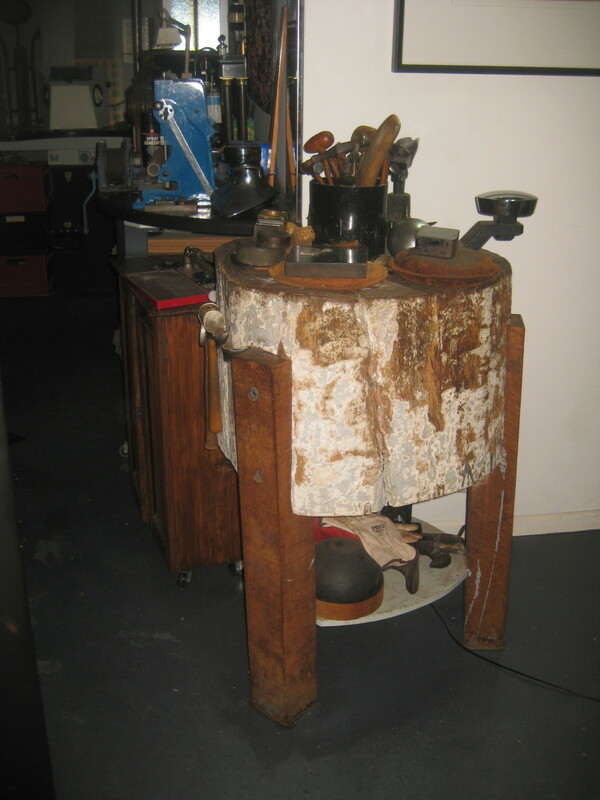 I met many jewelers with homemade hydraulic presses in their studios. Hydraulic presses are used to form metal, to cut out sheet metal shapes, to make bracelets, and even to do fine detail such as coining. Commercial presses for jewelers start around $800 and go up from there. 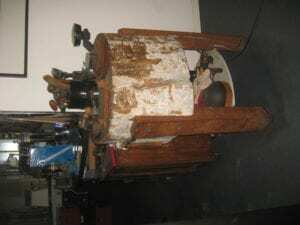 This homemade one has about $30 in parts plus an ordinary hydraulic car jack. There is no welding used in making it. The press consists of two pieces of steel U-channel with holes drilled in them, a piece of steel sheet in the middle with holes, four 1/2 inch-thick threaded rods with matching nuts, and two springs hooked into smaller holes in the top and middle plates. The jack pushes the middle steel sheet down, compressing and forming objects placed in the lower part of the press. Something else I saw were different versions of tool islands, which do not take up much room in a studio and create a great small working surface. Tool islands usually offer different heights than a bench, are more stable for hammering and punching operations, and are often used for tasks done while standing. They can also provide additional storage space, which is always at a premium in a jewelry workshop. A great one I spotted was made by Barbara Heath in Brisbane. She constructed it using a very heavy Australian wood that is many times harder than most North American woods, which adds to its stability and ability to last longer for metal shaping. She and her goldsmith use the island for flattening, hammering, stamping, and shaping metal on stakes that she can mount on it.